How can I protect my website with a password? 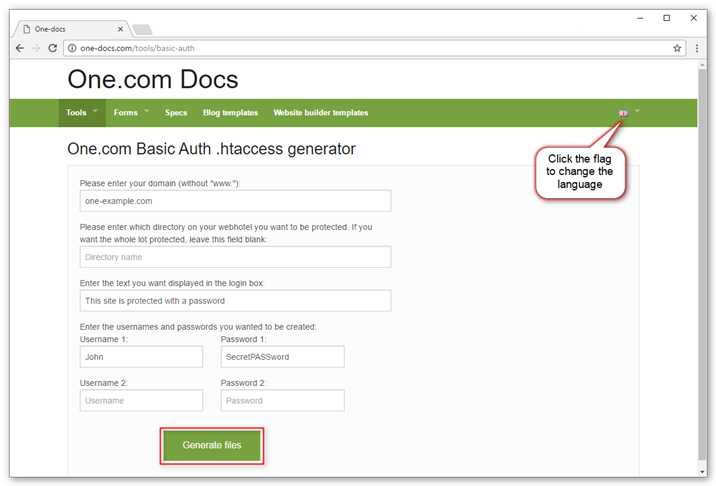 With .htaccess it is possible to protect your website with a password, so only authorized users can access it. First you need to generate the code. To make it easier for you we have created a tool for this. Go to the One.com .htaccess Tool and fill out the fields. Click on Generate files when you are done. Tip: If you only want to protect part of your website with a password, enter the name of the directory (folder) you want to protect in the Directory name field, for example wp-admin. Keep this page open in a separate window, you will need the information later. 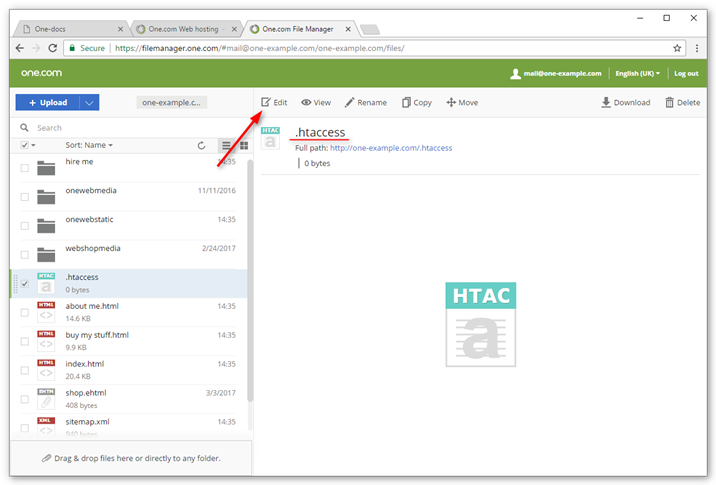 Tip: You can change the language of the .htaccess tool by clicking on the little flag in the top right corner. You now need to create two files and insert the code you just generated. Start with the .htaccess file. 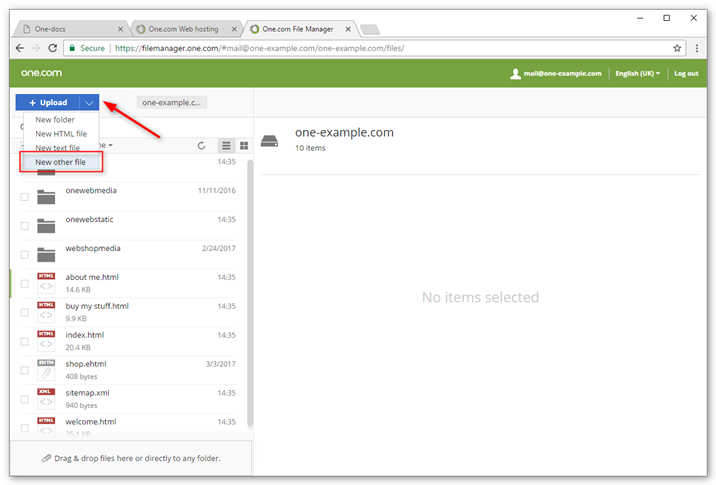 Open a new browser window and log in to your One.com control panel and open File Manager. 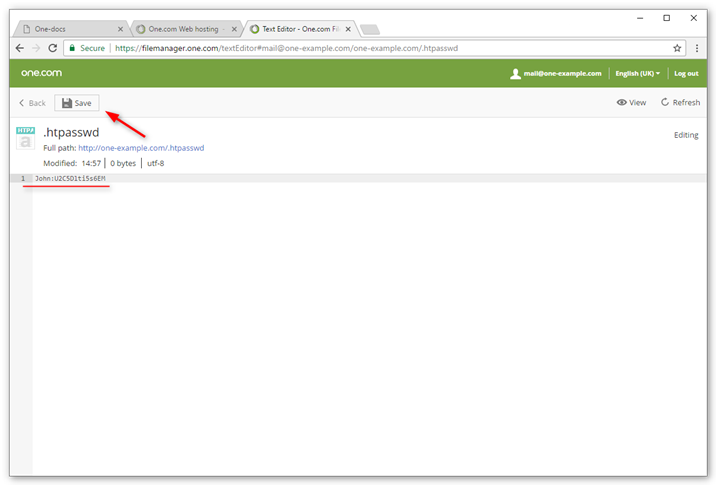 Click the arrow right of the upload button and select New other file. Note: If you only want to protect a specific directory (folder) and not your whole site, you need to create the .htaccess and .htpasswd files in the folder that you want to protect. Name the file .htaccess and press Enter on your keyboard. Select the .htaccess file and click Edit. Note: Don't forget the . (dot) at the beginning of the file name, so it looks like this: .htaccess. Enter the generated code for the .htaccess file, this is the second bit starting with AuthName. 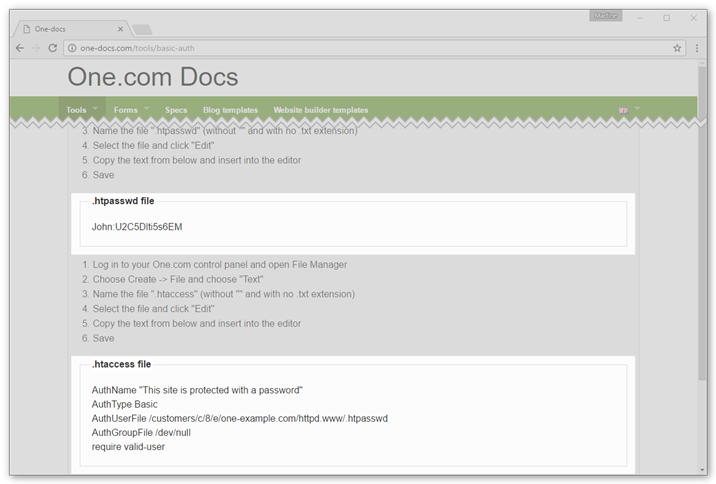 Stay in File Manager to create the .htpasswd file. This file will contain the username(s) and the encrypted password. Name the file .htpasswd and press Enter on your keyboard. Select the .htpasswd file and click Edit. Enter the generated code for the .htpasswd file. Go to your website and verify that it works. A popup should appear asking you to enter your user name and password. 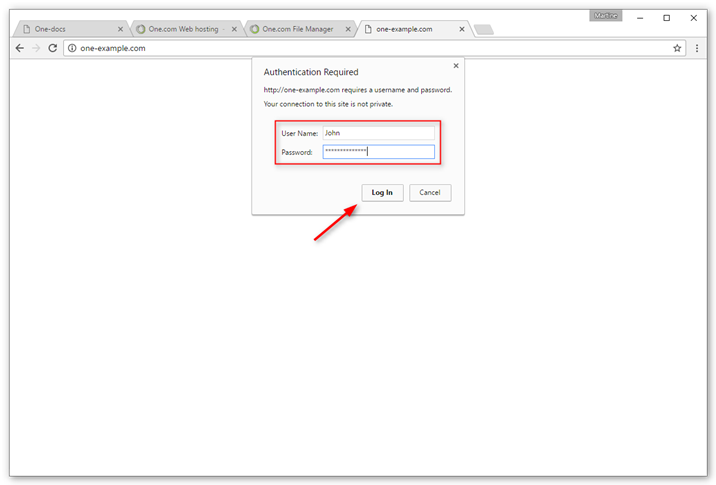 Enter the user name and password you specified earlier, when generating the code and click Log in to access your website. Congratulations, you are now done! How do I import a database to phpMyAdmin? How can I change the default charset? How can I disable the Varnish cache? How can I add a custom made error page? How do I set up FormMail? How can I change the default start page? 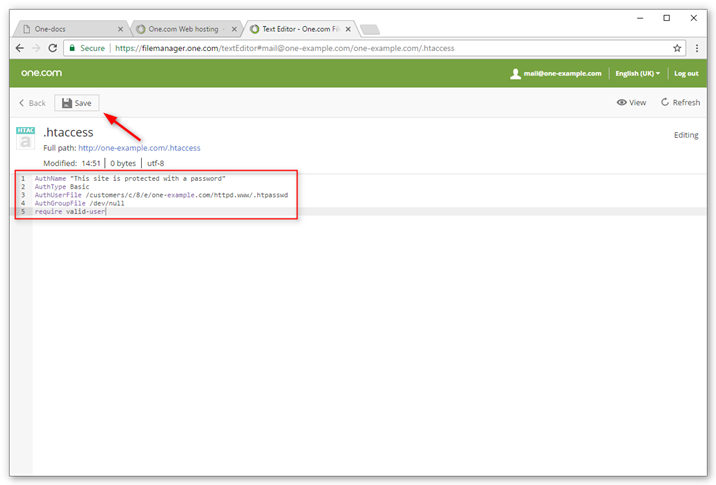 How can I redirect a visitor to another page?